It is hailed as one of India's finest wildlife destinations. Earlier the hunting reserve of the Maharajas of Jaipur, the park at Ranthambhore was once the scene of royal hunting parties. Today, it is famous for its tigers and is one of the best places in the country to see these majestic predators in the wild. The Park covers an area of nearly 400 sq. km. and is set between the Aravali and Vindhya ranges. Its deciduous forests were once a part of the magnificent jungles of Central India. The Fort is a massive enclave and quite high. Mughal Emperor Shah Alam gifted it to Sawai Madho Singh I of Jaipur in 1754 AD and since then it was maintained as the private hunting preserve. Much later, Queen Elizabeth II and Duke of Edinburgh were part of the Royal Hunting, who stayed here too. It’s a unique Rajput Fort. Archeological Department took it in 1964. It is 1578 ft from the sea level and 750ft from ground. Total area of the fort is about 7 miles. There is no drive way up to the fort, just the stairs. There are three big artificial lakes up in the Fort. Jogi Mahal is a forest rent house, some 250 years old, and commands the view of Padam Talao or the lotus lake on one side and the ramparts of Ranthambhore Fort. Adjacent to it is one of India’s largest banyan trees, fondly known as `walking tree’ because over the years it has sent out so many branches thereby increasing its shade area. This rest house was closed to the public in 1992. This is the largest of the lakes present in the park. The famous and beautiful Jogi Mahal is located at the very edge of this lake. When in season, the water lilies that give the lake its name can be seen in plenty. In the early hours of the morning and just before sunset, animals can be seen in large numbers on the lake side. It is in the shallow waters of this lake that the famous "lake hunters" of Ranthambore operate, the most legendary of which was the tiger, Genghis. It is also along this lake's edges that the rare sighting of the chinkara is most probable. This lake attracts thousands of migratory birds during winter and is especially exciting for bird-watchers. In these areas you can even find a herd of black buck, the rarely seen antelope of this arid region. This is probably the most picturesque of the three lakes, carpeted with lotus flowers and is filled with lotus-eaters; Rajbagh Lake has the highest density of sambar deer and marsh crocodile. The back pools and like little nurseries for chital and sambar whose young ones can be found here in large numbers .The areas around the Rajbagh Lake are also prime tiger spotting areas due to the kind of forest and it's accessibility to water sources. This is the smallest of the three lakes in Ranthambore National Park. But, as they say, all the best things come in small packages. This definitely holds true for Malik Lake. It is an area full of concentrated action all the time. It always seems to have a healthy population of birds of all kinds. Also seen at the lake very clearly and from a reasonably close distance are the Indian Marsh Crocodiles. It is quite common here to be able to watch a kingfisher on a hunt for small fish. This point gives you a virtual `aerial’ view of the Park and is well worth the time it takes getting there. You can see the dramatic hill ranges of the Aravallis and the Vindhyas from here. This is a lovely road full of tendu trees and is one of the most scenic drives in the Park. In the fruiting season of the tendu in March, the sloth bears of Ranthambhore feast along this road. On the far side of the Reserve is well worth a visit. 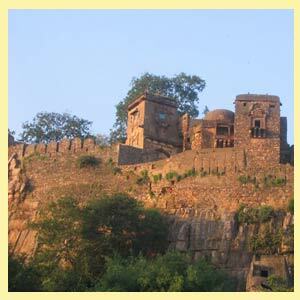 This imposing fort commands a stunning view of the area. This valley, which consists of many rocky outcrops and low hills, is located close to the outskirts of the park. A jeep would be the ideal mode of transport when trying to visit this area. This area contains a majority of the Panther population of the park. The panthers avoid venturing into the main jungle to avoid conflicts with tigers, which are known to kill them. This area also has a good population of bears. These areas located in the North-Western and Northern regions of the park are ideal locations to visit if looking for Sloth Bears. These areas have a lot of ant hills, which are a favourite of the bears. Although very rarely seen themselves, the pugmarks of the Indian striped Hyenas are often seen here. Their numbers are not very large in the park.